Sometimes it feels great to work out one's frustration on a dinner plate or mug. 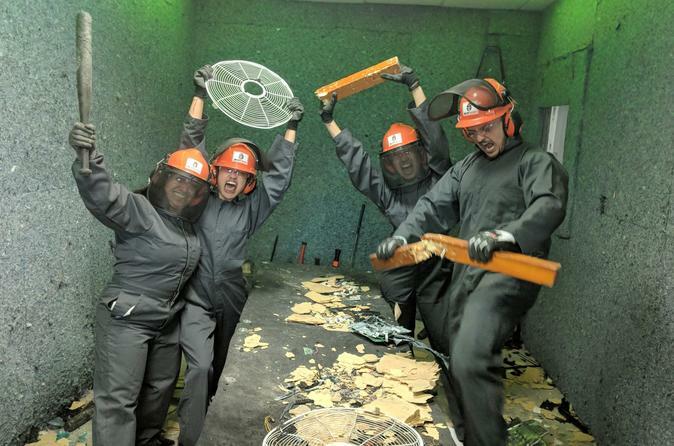 Sin City Smash makes this possible without ruining the flatware as their destruction therapy rooms allow customers to take their anger out on a bevy of breakable objects. This tension-relieving environment features small- to giant-sized objects to destroy along with an option for customers to bring in something to break using one of Sin City Smash's clobbering weapons. Safety remains a top priority, however, as they provide everything from hard hats to face shields so no one gets hurt while busting up some objects and easing stress. No need to feel guilty about the mess, as Sin City Smash cleans and recycles your mess! Look at you having fun and doing good deeds! Get the Ultimate VIP Smash Experience! Please arrive on time for your appointment and allow at least 30 minutes to 1 hour for your entire experience. Upon Check-in, you will gear up in our ANSI certified safety gear and briefed on safety procedures. Your Signature Smash will include a wide array of items such has computer monitors, printers, CPU towers, keyboards, laptops, plates, bottles, and other unique items. Standard smashing weapons come with your session (sledgehammer and baseball bat). You have 15 minutes to destroy everything in the room while raging out to our many playlists! Upon completion, you will be de-briefed and granted access to our VIP Lounge to complete your destruction therapy experience! Upgraded weapons and additional smashables can be added upon arrival. VIP Lounge Access subject to availability. Reservations strongly recommended.